Last year was massive for Backstitch. We brought in whole new categories of thread, haberdashery, tools and notions, and kits. We opened a real life actual shop - our gorgeous haberdashery is just outside Cambridge - and we started running all sorts of sewing classes in dressmaking, quilting, embroidery and more. I'm pretty confident that 2015 is going to be just as big. We have lots of ideas forming, not least a big plan to get much more active on this blog! 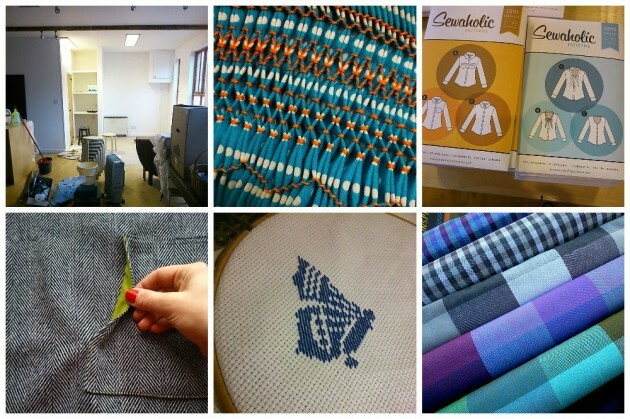 One thing I want to do regularly is 'A Month In Snapshot' of life at Backstitch. Shall we see how the first pans out?! The biggest change in January was our refit that we completed over Christmas. We now have much more retail space and our class studio space is way improved too. On classes, we ran our first Introduction to Smocking class and our first Introduction to Machine Embroidery class which were huge successes. We started offering sewing machine servicing and repairs from our Cambridge shop: details here. New sewing patterns for January include the Granville Shirt and Oakridge Blouse from Sewaholic, the Linden Sweatshirt from Grainline Studio, and the Bonnie Sweater and Violet Dress from Bluegingerdoll. New Dress Fabrics for January include the Peppered Cotton Fancies Plaid and Check Shot Cotton, Clipdot Embroidered Lawn in White and Midnite and the Regent Street floral lawns from Moda. New quilting fabrics this month include Pam Kitty Garden, Airmail, and a stack of new Charm Packs. Makes include the finished Popover Poncho blogged here, and the beginnings of a cross stitch butterfly... more on that another time! Well done on achieving so much in 2014! I only wish I lived closer to your lovely shop. Just purchased some Merchant and Mills goodies for my sister from you over the weekend - she is taking her first sewing class soon, and I think it's so nice to have lovely tools to work with.